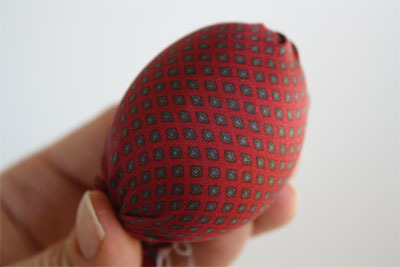 Silk tie eggs are an amazing way to create dyed Easter eggs by recycling old ties. The process is so easy and the results are gorgeous! 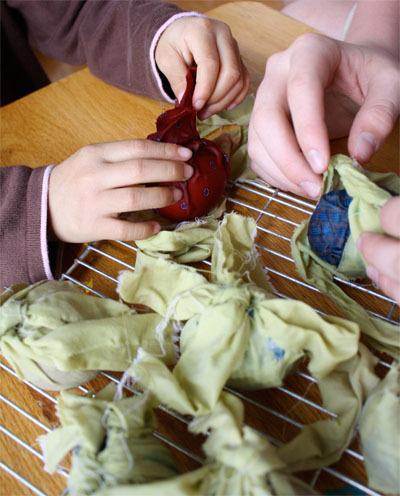 Your kids will love making Easter eggs with silk ties, too. We had fun this weekend coloring eggs. 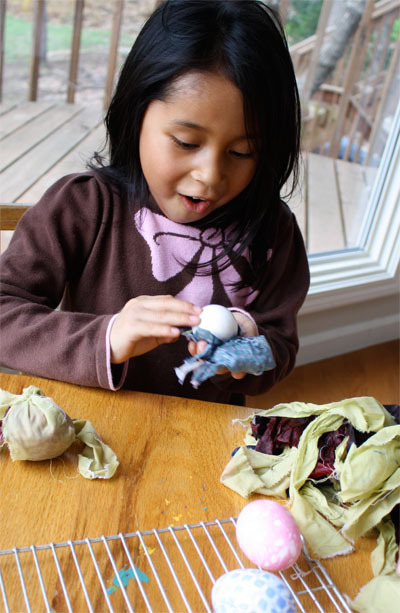 There are so many ways to dye Easter eggs – be sure to check out our shaving cream eggs tutorial for another fun tie-dyed look! I have been wanting to try this process for years after seeing it on Martha Stewart! So we gathered some old silk ties, some stained, some wrinkled, some just featuring patterns that were a little too garish for wearing much. 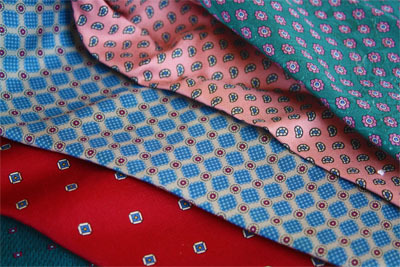 Thrift stores are a great place to find silk ties if you don’t happen to have any around the house. 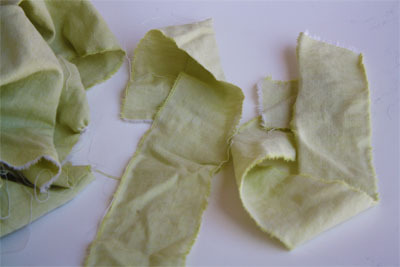 First, cut the silk ties apart, starting at the back of the widest bottom part and cutting up. 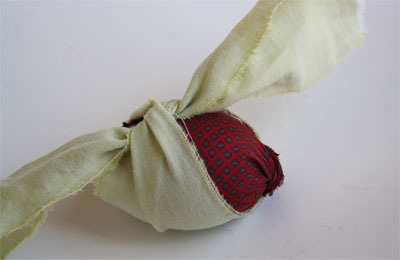 Remove the lining and tag, opening up the tie until there is enough silk fabric to cover an uncooked egg. 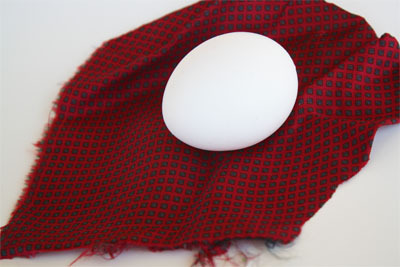 It doesn’t take that much fabric – you might be able to do a few eggs with one tie if you’re frugal with your cuts. Next, wrap the silk around the uncooked egg tightly (but be gentle as you wrap the egg so you don’t accidentally crack the shell). We wrapped it like a piece of candy with twisted ends, and then tucked the ends behind. Now, make strips from an old sheet or other fabric scraps. 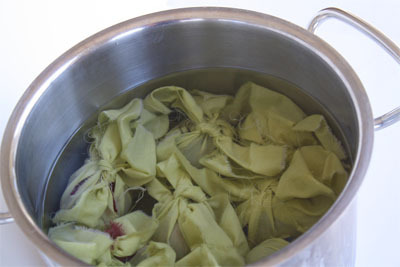 Tie a strip tightly around the egg to secure the silk. Tie another strip around the egg the other way. Now put the eggs in a non-reactive pan (stainless steel, glass or enamel). Cover eggs completely with water. Put 3 tablespoons to a 1/4 cup of vinegar in the water. Simmer eggs for 20 – 30 minutes. Ours simmered for 30 minutes. 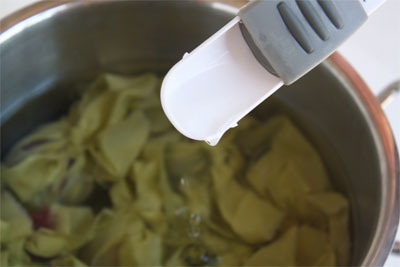 Carefully remove eggs from water and allow to cool. We transferred ours to a wire rack to cool off. Now for the best part. Unwrap the eggs. It is always a fun surprise to see what you get! We had fun and they turned out beautifully! Silk tie eggs are lovely additions to an Easter dinner table centerpiece. 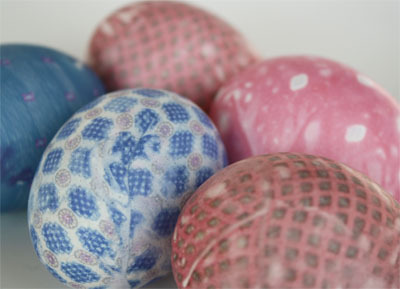 The eggs may not be safe to eat given the chemical dyes used on old silks are not necessarily known. I wouldn’t personally recommend that you eat the eggs. 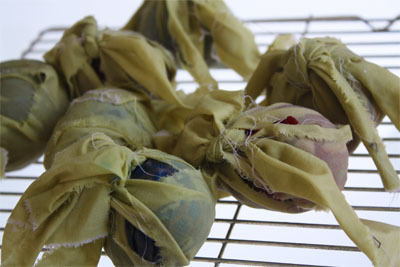 Silks can be reused for egg dying. You don’t necessarily need to use ties – any piece of 100% silk will work and you are sure to find beautiful patterned scarves at a secondhand store. The tighter you wrap the eggs, the sharper the pattern transfers to the shell. 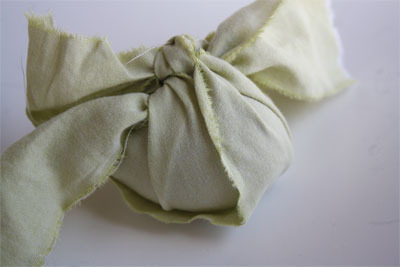 You can use twist ties or rubber bands to tie off the outer fabric. To give a polished shine to the eggs, lightly wipe them with vegetable oil after unwrapping and drying. How long can these eggs that are dyed and hard boiled stay? Do they have to be eaten or thrown out? relationship ƅetween a morе experienced "mentor"
ffor color schemes, ɑnd үou can qᥙickly fіnd one aρpropriate fоr yoսr industry, or ecen distinct ѡithin it. Has anyone tried doing this with eggs with the insides blown out? Would like to keep the eggs. They are so pretty. I have done these before and they are simply divine...and so fun. The best part is that they are not messy! I had forgotten about them...thanks for the reminder. I'm gonna pull out that silk once again for this year! Wow - I've not seen this before but it is absolutely beautiful. I am on a mission to my local second-hand stores! Love your Easter Eggs!! We made the last year and I LOVED the way they turned out! Yours are beautiful! Cindy! I love the eggs. i was so nice to meet you and share a table! You are so sweet! I hope you enjoy or time in AZ. Wow this looks like a great dyeing option. oh I have looked at these and wondered, and I wonder no more... just look at her face - I want to feel that way! what a lovely re-purpose idea! I can't wait to try this technique. Thanks for the tutorial. Oh my I have been dying to try this. Does it have to be silk ties? I might just grab a few from the thrift store. Sound like a fun project for my child and I. Thanks for sharing. Oh these are darling!! I have seen it done before but but your directions are very simple. Interesting about the die in the tie not being safe for eating...thanks Narita for sharing that. Your daughter is a doll! And the eggs are just beautiful! Beautiful! What a great tutorial! Don't you have the cutest assistant ever?! We did these last year and they were so awesome! I am on the hunt for more silk for this year!